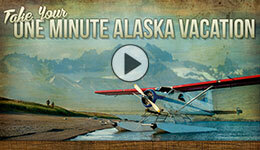 The One Minute Alaska Vacation is usually about inspiration, relaxation and enjoyment. Today, we bring a message to inspire a call to action: It’s about The Pebble Mine. Again. Pebble, the proposed mega-mine at the headwaters of the two richest Bristol Bay salmon rivers, which we have been fighting for 20 years and thought gone, suddenly has found renewed vigor. It’s been repackaged as a ‘smaller footprint mine’ to dig only 10% of the proven mineral deposit. The repackaged mine is presently up for a Federal Permit under the Army Corp of Engineers. The Permit is being fast-tracked with many unaddressed loop holes. Unless we stop it here, this proposed Federal permit would open the gate to attainable State permits. The worst aspect of this repackaging is the obvious ploy of it being a classic Trojan Horse, that, once permitted, will allow Pebble to be expanded. Pebble obviously learned the lesson that it’s easier to permit a small mine and modify the permit than it is to permit a giant mine. Pebble Mine threatens one of the world’s last great salmon fisheries. North America’s salmon powerhouse, Bristol Bay, Alaska, is threatened by the massive proposed gold and copper mine. Working closely with commercial fishermen, tribes, sportsmen and women, local businesses and many others across the country Trout Unlimited works to protect these iconic and productive rivers and the people they support. After over a decade, Pebble applied for one of the major permits it will need to move the mine forward. In December 2017, Pebble submitted its first major federal permit application to the U.S. Army Corps of Engineers. Click here to learn about Pebble’s mine plan. Filing for this application kick-started the federal permitting and environmental review process. Per this initial permit application, Pebble seeks to develop the first 1.5 billion tons of its nearly 11 billion-ton deposit and set the stage for future expansion and the construction of an industrial mining district in Bristol Bay. The Corps of Engineers has begun a review of Pebble’s mine plan and it’s critical for us to stay engaged at every juncture of the permitting process. Check the take action page for the latest opportunity to weigh in. Thank you for your time, interest and support.